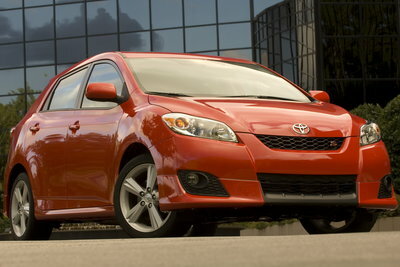 Though the name sounds trendy, the Matrix has proven that practical small cars can sell very well in the U.S. market. The Matrix is built alongside the Pontiac Vibe in California. A standard 132-bhp 1.8L I-4 drives the front wheels in the base models; whereas a larger displacement 2.4L four-cylinder rated at 158-bhp is found in higher trim levels. A five-speed manual is standard on all models except those with AWD. The versatile 5-door body style features a large hatch to provide access to a cargo area finished in a hard durable plastic for utility. With its ample cargo room, head-curtain side airbags, and choice of engines, the Matrix is a great combination of practicality, safety, and performance. The second generation Matrix features a new profile with a lower roofline. The side profile is substantially different and features a thick c-pillar where the prior model had more glass and the look of a small wagon. Aside from the reduced height, all other measurements are virtually the same. Engine options include a 1.8L I4 rated at 132-bhp, and a 2.4L rated at 158-bhp. All-wheel-drive returns to the lineup after a brief absence.